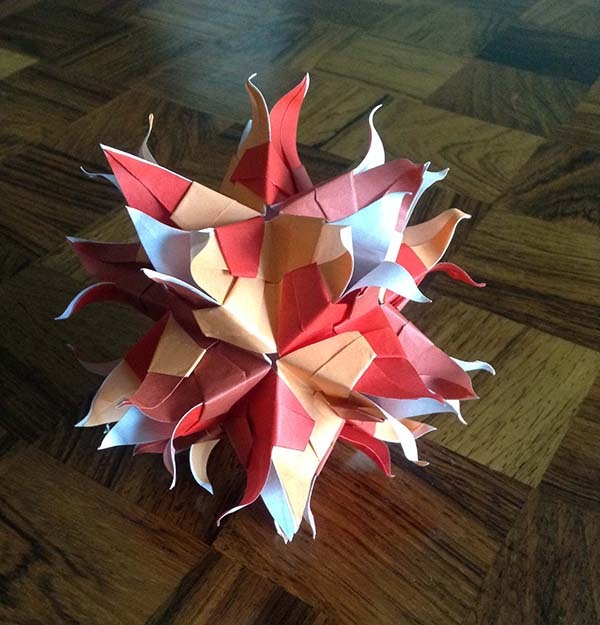 Ah, here’s a lovely origami model that I have not yet shared. Not much to say about this one. It’s a 30-unit model with icosahedral symmetry. I used 3 distinct colors, and the petals are curled with a toothpick. It looks like a bascetta star. Did you simply cut the tips open? No, there’s no cutting involved. The attachment of units is a bit unusual–each unit has a long appendage that reaches over to the next unit and gets tucked into a pocket. This leaves the tips of the star unattached, so they can be curled freely. Ah, OK. With the bascetta stars they’re wrapped snugly all around, so there’s nothing you could curl.